Amanda Abella is an online business coach, speaker and author of the Amazon bestselling book "Make Money Your Honey: A Spirited Entrepreneur’s Guide to Having a Love Affair with Work and Money." She is committed to helping millennials (and anyone who wants to join us) have a better relationship with work and money by means of entrepreneurship, online marketing and abundance mindset. Her work has been featured in Forbes, The Huffington Post, Seventeen and Business Insider among other top publications. She has also spoken at a national level for The Financial Blogger Conference, Femfessionals, American Student Assistance and more. Lastly she is a regular contributor for popular blogs like Money Under 30, Care2, Wisdom Times and several others. When she’s not making money her honey you can find Amanda drinking tea, collecting gemstones, going for a run or looking for something new to learn. 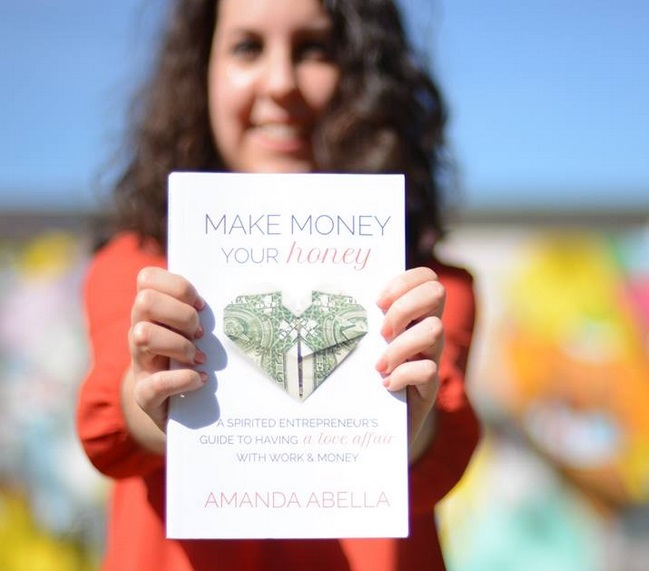 Amanda Abella is the creator of the Make Money Your Honey Coaching process, business coach to millennial entrepreneurs, and the author of the Amazon bestselling book Make Money Your Honey. I take topics that are notoriously scary or seem complicated for people - online marketing, sales, money, etc. - and break them down into simple, practical and easy to understand steps that get results. I'm real and practical. My advice works and I make sure not to over-inflate expectations. I feel like my field has started to get a bad rap because of some individuals who would rather make money off of people by making false promises. I make sure my team, my clients and my community don’t get suckered into that so they can build online businesses that actually work. By focusing on one thing at a time. A challenge for me has been having my hand in too many pots. On the one hand, this helped me build a foundation for multiple streams of income. On the other, I was distracted for a long time which led to lackluster results. By focusing on doing one thing at a time, doing it well and then moving on to the next project I will continue on my journey to becoming the best. Personal: To give and receive love. That’s really it. Business: To build a solid community. It’s not about numbers for me, it’s about building a family that supports each other on their entrepreneurial journey. Consequently numbers grow as a result of that. Philosophy and psychology. Can’t get enough of the stuff! Gabrielle Bernstein has been a huge inspiration to me. That opened the door to finding a lot of other people I respect and admire. Paul Jarvis is high up on my list lately as well. My favorite coffee shop I escape to when I need to get out of the home office. Nurture My Body skincare and hair products. Totally worth the price tag for vegan products that work and feel amazing. As for my business, we’re currently having a love affair with Infusionsoft. Running, yoga, meditation, art and reading. I’ve always got my head in a book and I’m a mess if I don’t exercise and meditate.